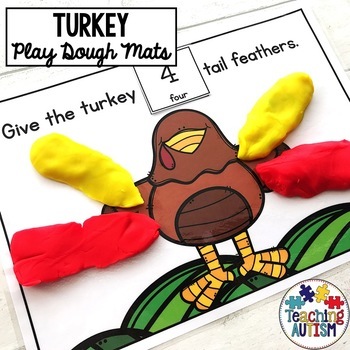 These turkey play dough mats are fun and engaging for your students. Students will work on their counting, color recognition and instruction skills. The play dough mats come in 2 levels. The play dough require your students to read - or be read - the instructions. Then, they follow the instructions to create the turkey's tail feathers. This activity is also a great way for students to work on their fine motor skills. 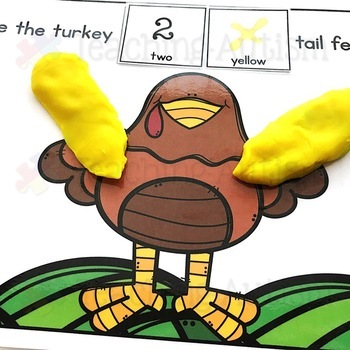 Students use play dough to make the tail feathers, giving the activity a sensory approach. This also helps the play dough mats to become more engaging for your students. 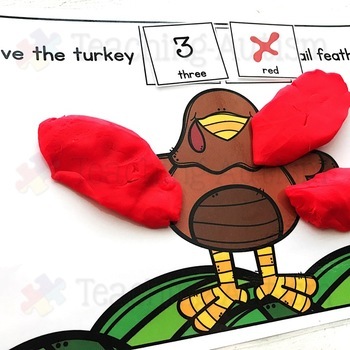 • Level 1 "Put 1 tail feather on the turkey"
• Level 2 "Put 2 red tail feathers on the turkey" etc. The play dough mats come complete with matching symbols for you to use. There are 2 play dough mats included. You use the included symbols on the play dough mats. This is a great way to help you minimise your printing costs. I recommend laminating the play dough mats and the individual symbols. This will make them stronger, longer lasting and reusable in the future.